Built using hand-picked components to help withstand tough conditions in the field, the G-Technology R-Series line provides rugged storage. And with the G-DRIVE R-Series mobile SSD, you get IP67 water and dust resistance, 9.8' / 3.0m drop protection on a carpeted concrete floor, and a crushproof rating of 1000 pounds. Featuring transfer speeds of up to 560 MB/s, the G-DRIVE R-Series mobile SSD is a fast external SSD that lets you can quickly edit and save large video and photo source files. 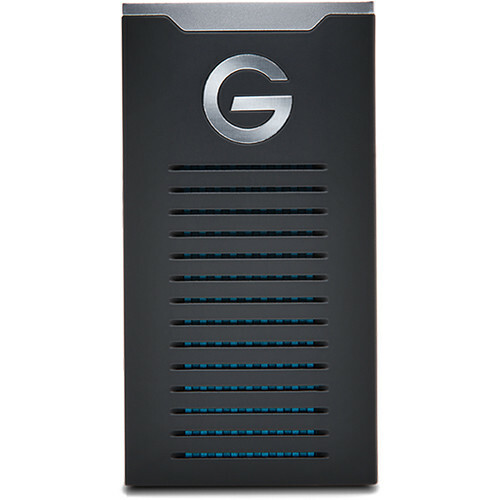 The G-DRIVE R-Series mobile SSD is ready for updated Mac computers and other laptops through a reversible USB-C port with a 10 Gb/s USB 3.1 interface, which is also known as USB 3.1 Gen 2. It comes with a USB 3.0/2.0 cable adapter for backwards compatibility. SSDs don't utilize moving parts, so the G-DRIVE R-Series mobile SSD is able to endure accidental bumps or drops to help protect against data loss and system failures. With a capacity of 500GB, the G-DRIVE R-Series mobile SSD R-Series provides light, pocket-sized storage to keep your 4K footage, high-res photos, and media libraries to edit and save, virtually anywhere. G-Tech is excited to introduce their Compatibility Solutions for Windows 10, 8.1 and 7. To improve the experience for Windows users, they have added a G-UTILITIES folder with compatibility solutions, which can be downloaded from their Windows landing page. Explaining what each of the installers are and step-by-step instructions on how to install the HFS+ driver for Windows by Paragon or G-Technology Format Wizard. By installing the HFS+ driver for Windows by Paragon on their Windows 10, 8.1 or 7 system, customers will be able to read/write to their G-Technology HFS+ formatted drive(s) from such PC, in addition to their Mac computer. By installing the G-Technology Format Wizard, users can reformat their G-Technology HFS+ formatted drive to NTFS to be used with Windows-only systems. Please be aware that reformatting the drive to NTFS will erase all current data on the drive and it will no longer be compatible with macOS. Please be sure to back up all data prior to performing this install. An HTML file that will direct users to G-Technology's Windows Compatibility landing page. 500GB G-DRIVE R-Series USB 3.1 Type-C mobile SSD is rated 4.8 out of 5 by 36. Rated 5 out of 5 by Richard from Excellent Value, Nice Size I almost bought the Samsung T5, but this model is often on sale for $100 cheaper for the same speed. ?Its a tad larger but has excellent build quality. ?Blackmagic test puts it at 413mb/s write, and 516mb/s read time. ?It comes with two short cables that I wish were more flexible. ?The exterior is plastic, which protects the second blue aluminum exterior on the inside. Rated 4 out of 5 by Jon from You know what? It's real fast and durable, which is great! Just a 2-inch connector though, which is pretty impractical unless you're using it exclusively for laptops. I'd give it 5 stars if it weren't for the tiny cable. Rated 5 out of 5 by Adam from Amazing SSD The cord is a little shorter than I expected, but this is a beast of a hard drive housed in a tiny device. Rated 5 out of 5 by Carlos from Small size great performance Big performance in a small package. I’m always traveling and this is now part of my “essentials” kit. Rated 4 out of 5 by Gino from Great! A lot of fast storage in a small package! Very happy with this purchase so far. I give it 4 stars only because of the short cable that comes with it. With it connected to the back of my 27 inch iMac it just hangs off the back of the computer. Had to purchase a longer cable. And when you’re paying that kind of money it shouldn’t have a longer cable. Rated 5 out of 5 by Maciej from super fast I use it on usb-c, macbook pro 13, super fast, very nice, well made, with good materials, only a short cable but I think I would prefer a little longer. Rated 4 out of 5 by Jason from Great drive... Questionable Dongles Love the drive, small, fast, silent. The USB-C dongles they provide are comically short and make anything but desktop use a precarious balancing game. Does it come with a proprietary software for securing files? I purchase two drives and to the best of my knowledge there was no proprietary software for securing files. I reformatted the drive for MacOS, and can use native MacOS software for file security. This drive is USB only, it can only be used with the Thunderbolt/USB combo port or straight USB. It will not work with any other connection type. Would you recommend this SSD for video editing? Yes, it is has very high speed through USB and is great for any type of use. Will this work for Xbox one X? Does this drive with HFS actually format to a full 2048 GB or is it something closer to 1800 GB because of the whole 1000 vs 1024 calculation? How fast are the read/write speed specs with an A-C cable? With the included USB-C to USB-A cable I have read and write speeds of aproximately 100 to 120 mb/s. Considere that the bus for the USB-A connector of my laptop is USB 2.0. I think that with the USB 3.0 or USB 3.1 bus the read/write speeds have to be much faster. what kind of read/write speeds can I expect using USB 3.0?